In February 2019, it is reported, Mary Daly, William Barr's oldest daughter, is to leave her position at the United States Deputy Attorney General's office for a FinCEN position. ^ a b c Shasky Calvery, Jennifer (November 18, 2013). "Statement of Jennifer Shasky Calvery, Director Financial Crimes Enforcement Network US Department of the Treasury Before the US Senate Committee on Homeland Security and Government Affairs". Financial Crimes Enforcement Network. Retrieved 6 March 2014. ^ a b "FinCEN - What we do". FinCEN website. FinCEN. Retrieved 13 November 2016. 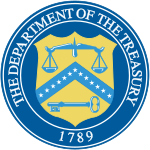 ^ "TREASURY ORDER 180-01". U.S. Dept Treasury. March 24, 2003. Retrieved 6 March 2014. ^ a b "FinCEN - FinCEN's IT Modernization Efforts FAQs". FinCEN website. FinCEN. Archived from the original on 17 February 2014. Retrieved 6 March 2014. ^ "FinCEN - What we do". FinCEN website. FinCEN. Retrieved 13 November 2016. ^ "Appendix A – Financial Crimes enforcement network programs" (PDF). FinCEN. Retrieved 23 August 2016. ^ "Informal Value Transfer Systems" (PDF). Financial Crimes Enforcement Network FinCEN Advisory. United States Department of the Treasury. March 2003. Archived from the original (PDF) on 30 June 2014. Retrieved 6 March 2014. ^ "Informal Value Transfer Systems". Financial Crimes Enforcement Network. September 1, 2010. Archived from the original on September 5, 2010. ^ "FIN-2013-G001: Application of FinCEN's Regulations to Persons Administering, Exchanging, or Using Virtual Currencies". Financial Crimes Enforcement Network. 18 March 2013. p. 6. Archived from the original on 19 March 2013. Retrieved 4 March 2014. ^ Berson, Susan A. (2013). "Some basic rules for using 'bitcoin' as virtual money". American Bar Association. Retrieved 10 September 2013. ^ "Acting Assistant Attorney General Mythili Raman Testifies". Senate Committee on Homeland Security and Governmental Affairs. Washington, D.C: justice.gov. November 18, 2013. Retrieved 6 March 2014. ^ a b "Bank Secrecy Act: Federal Agencies Should Take Action to Further Improve Coordination and Information-Sharing Efforts". GAO-09-227. GAO.gov. Feb 12, 2009. Retrieved 6 March 2014. ^ Bercu, Stephen (December 1991). "FinCEN: Big Brother After All?". EEF.org. ^ Julie Wakefield (October 1, 2000). "Following the Money". Government Executive. Retrieved 6 March 2014. ^ Walter Olson (2012-04-20). ""Structuring": who can get away with it, and who can't". Overlawyered. Retrieved 2013-11-30. ^ David Johnston; Stephen Labaton (March 12, 2008). "The Reports That Drew Federal Eyes to Spitzer". The New York Times. ^ Bess Levin (February 14, 2019). "William Barr's Son-in-Law Just Landed a Job Advising Trump on "Legal Issues; Tyler McGaughey's work will "intersect" with the Russia investigation". VanityFair.com. Retrieved 20 February 2019. ^ "Attorney General Nominee William Barr's Son-in-Law to Join White House Counsel's Office: Report". TheDailyBeast.com. February 13, 2019. Retrieved 20 February 2019. ^ Wells, Tish (October 15, 2016). "Film Review: The Accountant (2016)". Retrieved November 16, 2016. 1990 establishments in Washington, D.C.